Gates to Paradise / Bramy raju / Die Pforten des Paradieses. 1968. Gates to Paradise is a 1968 film by Polish director Andrzej Wajda. 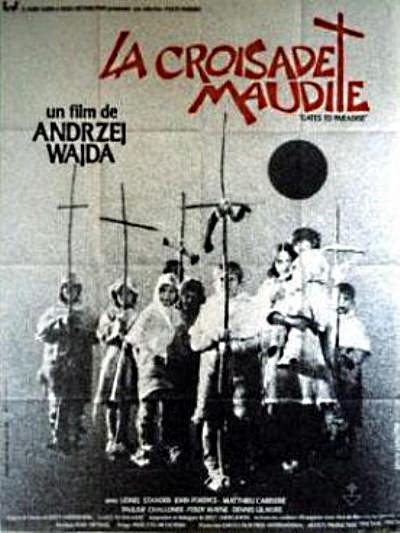 The film is set in medieval France and is based on a story by Polish writer Jerzy Andrzejewski (1960) that seeks to expose the motives behind youthful religious zeal. It was entered into the 18th Berlin International Film Festival. A group of children left their homes to follow Jacques de Cloyes (John Fordyce) in his pilgrim to Jerusalem. Jacques is saying that he had heard the Voice of God telling him to go to Jerusalem to find the grave of Jesus. While on their way there, a monk (Lionel Stander) accompany them. Some of the children (girls and boys) makes a confession to the monk, their unrequited love for Jacques, their jealousies. Last one to confess was Jacques himself, a boy so beautiful that girls and boys and even man fell in love with him. In the end, is it really the Voice of God he heard? Cast: Lionel Stander, Ferdy Mayne, Pauline Challoner, Mathieu Carrière, Jenny Agutter, John Fordyce, Denis Gilmore, Kynaston Reeves, Janez Vrhovec, Dragomir Felba, Gojko Kovacevic, Ljubomir Radovic. Download Gates to Paradise / Bramy raju / Die Pforten des Paradieses.